Addiction is a brain disease expressed as compulsive behaviors. It is a chronic, medical treatable disorder. Alcohol and drug addiction is continued substance use despite having recurrent, extreme and persistent social, emotional, financial and interpersonal problems in relation to or as an effect of substance use. Substance abuse and dependence affects the brain, which in turn affects our thoughts, feelings and behaviors. Why do individuals take drugs in the first place? People take drugs to feel good (seeking sensations) and to feel better (self-­‐medication). Substance use starts out as a voluntary decision but can lead to compulsive addictive behaviors. Addiction affects everyone and every type of person can be part of this disease. Look around, the face of addiction can be anywhere in any situation. Initially a person takes a drug to change their temporary emotional state but they don’t realize they are changing the biology of the brain. After prolonged drug use the substance abusers have rewired their brains in long-­‐lasting fundamental ways. All individuals are unique, not everyone who has a problem with substance use has a chronic problem. Some people are able to stop with a single addiction treatment visit or even stop on their own. There are another group of substance users who have persistent and severe addiction use. 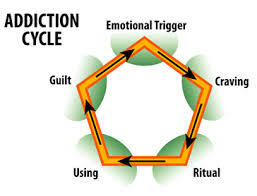 The characteristics of severe addictive disorders are as follows: Family history of substance use, early onset of use, trauma during childhood, more frequent intense substance use, personal or environmental obstacles to recovery and limited internal and external resources to initiate and sustain recovery. With severe addictive disorders maintaining sobriety can be extremely difficult. Relapse is very common, normally the expectation and not the exception. It is important to think of addiction as a medical concern like diabetes, asthma and hypertension. Addiction has a profound impact on public health and safety. There are many components of recovery treatment and there is no “one size fits all” approach. Collaborative treatment services should be tailored to the individual’s needs. In addiction recovery, we need to treat the whole person! It is important to look at cognition, behavior feelings, social context and unresolved emotional or physical traumas. Remember, addiction does not discriminate and can lure anyone into its web of destruction. Successful and lead to relapse. Counseling is a critical component for effective addiction recovery to learn new effective skills in dealing with overwhelming situations or feelings. An adequate period of time in counseling is critical for effectiveness and long-­‐term sobriety. Initially, there can be an ambivalence to change due to doing what is comfortable or known. In counseling, clients can identify and gain awareness in working with emotional or environmental triggers and choose different healthy choices instead of self-­‐medicating through the use of substances. If we are able to view and treat addiction as chronic, relapsing illness, we can take new approach and start an alternative journey of recovery where healthy coping strategies can best be utilized. With this mindset, the sky is the limit!